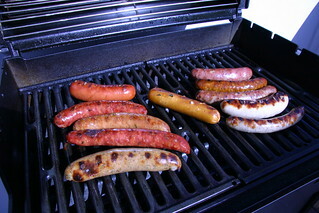 Stella picked up 10 different sausages raw from Rosamunde Sausage Grill in San Francisco for my birthday. This was with my approval, which may seem strange since I don't eat meat. We had a few people over and they loved the variety, though. I had a smoked salmon sausage (in the middle), which are great!